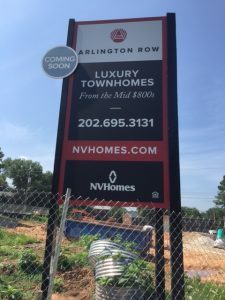 In the Westover neighborhood of north Arlington, 450 older affordable units are at risk of demolition and redevelopment, but the land use and regulatory tools that could preserve these units are complicated and costly. And time may be running out – in the past two years, 62 units have been demolished to make way for luxury high-end townhouses. Can a portion or the entire remainder of these units be saved? Westover is centered along Washington Boulevard in north Arlington between N. McKinley Street and N. Jefferson Street, a pedestrian-friendly community accessible to shops, jobs and public transit. It is also listed on the National Register of Historic Places as the Westover Historic District. Although Westover is listed as an historic district on the National Register, that designation does not provide any protections for these older apartment complexes. Each year, over 1000 apartments are lost to demolition, conversion or rising rents in Arlington. In 2016, the average rent for a market-rate two bedroom apartment in Arlington is $2,478, and the median sales price for a home is $623,500. Two-bedroom apartments that are Committed Affordable Units or CAFs – rent for $1,474 for a four person household earning $65,000 annually. 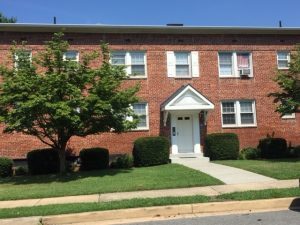 Currently, there are 223 CAFs in Westover owned by AHC and Arlington Partnership for Affordable Housing (APAH), two area nonprofit housing developers. Through recent negotiations with current building owners, APAH has secured a contract for 60 to 70 of the remaining market affordable rental units in Westover. At the Sept 24th County Board meeting, they will request a loan from the County’s Affordable Housing Investment Fund (AHIF) to support the acquisition of these units. Their goal is to move quickly to acquire the properties, and then seek financing to upgrade the buildings and keep them affordable for the long term. Arlington will consider all of their land use and regulatory tools to determine how best to preserve these units as affordable to lower income households. Additional density to increase the number of affordable units may be needed as part of an acquisition strategy since the purchase price will be greater per unit than a typical new construction project. However this will be a sensitive issue, as many in the community who support preservation would like to achieve it without additional density to maintain the existing look and feel of the neighborhood. While all options are on the table, three tools are receiving additional consideration by staff. Acquisition. Purchasing the buildings outright is the surest, most expeditious way to preserve these units. Doing so with a mission-focused organization like a nonprofit housing developer ensures that the properties will be well-maintained and committed to long-term affordability. However, the competition with market forces makes the acquisition cost very high. The significant amount of public resources needed to support this option must be weighed against the benefit of preserving a relatively small number of units. Transfer of Development Rights. The Transfer of Development Rights (TDR) program allows projects to transfer density and other development rights from one parcel to another, where deemed appropriate, when it preserves affordable housing among other things. This strategy has been used infrequently in Arlington, and there are some provisions in the program that make implementation less effective and more time-consuming. Since the county does not have an existing TDR bank to buy and sell density credits, “Sending Zones” and “Receiving Zones” must be established. To preserve these units, the current owners must be able to sell their density to a developer who can use it in another part of the county. Under existing county guidelines, any transfer of density needs to be approved, project-by-project, by the county board. This does not provide the seller with the level of confidence needed to ensure that the transaction will be successful. County Historic District. Designating these buildings as part of a County Historic District would provide protection for the structures, and extend the financial incentive for qualified rehab work through the historic tax credits. However, the lengthy process to secure County Historic District status – potentially two years – does not offer a timely or practical solution to imminent demolition. Preserving affordable housing in Westover will be costly, and it’s unlikely that all 450 remaining units can be saved. The County has taken steps to bolster their preservation efforts by identifying nine market rate affordable clusters that are also at risk, with plans to examine and implement strategies that can be used to keep them affordable. But given the existing conditions, market forces can move quickly into these desirable locations, challenging the very tools and resources that local governments have at their disposal. Unfortunately, this scenario is not unique to Westover. Hundreds of older, market affordable apartments scattered throughout the inner suburbs of DC are being subjected to the same pressures to redevelop. Are we prepared to protect this valuable affordable housing stock?